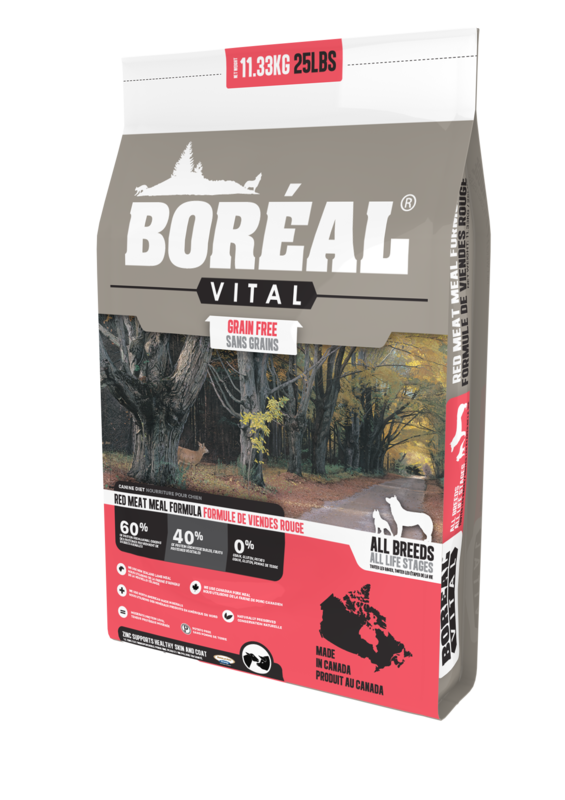 Boréal Vital All Breed Red Meat Meal is a grain free diet with a limited ingredient list. 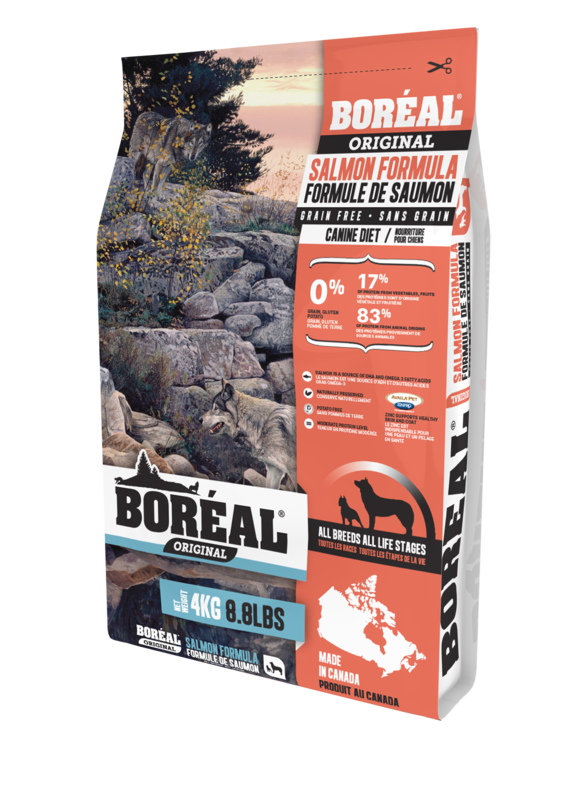 This is an everyday diet which can be used to help keep weight off your dog as well can be used as a hypoallergenic formula. Using a core of beans and peas to replace the grains found in many dog foods, our low glycemic index ingredients will help keep a dog feeling full longer after they eat. We use Canadian pork and New Zealand lamb. This is a diet for all life stages and is grain and gluten free. Naturally preserved, we use Availa®-Pet from Zinpro Performance Minerals® and add Availa®-Zn, an organic zinc that will help skin and coat conditions, especially with Northern breeds. 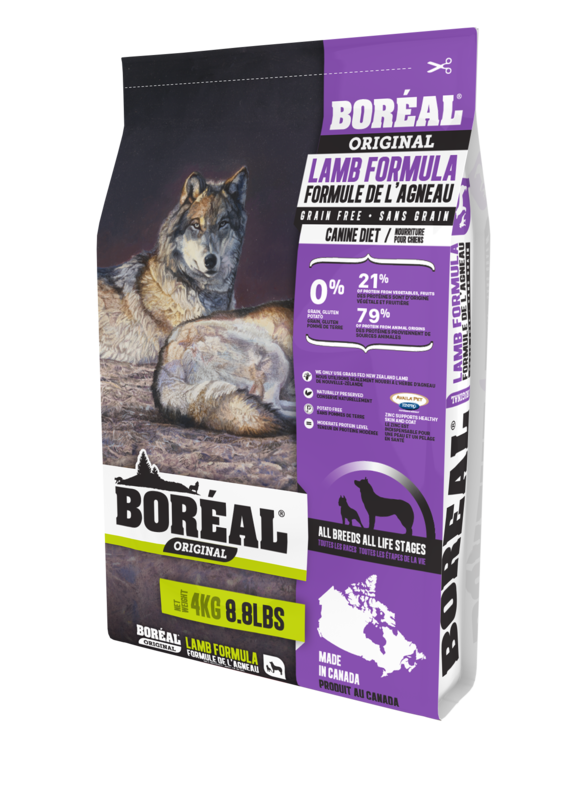 Lamb Meal, White Beans, Pork Meal, Pea Flour, Lentils, Canola Oil (Preserved With Mixed Tocopherols And Citric Acid), Flaxseeds, Dried Plain Beet Pulp, Natural Flavor, Yeast Culture, Lecithin, Choline Chloride, Taurine, Salt, Potassium Chloride, Blueberries, Cranberries, Apples, Carrots, Spinach, DL-Methionine, Yeast Extract, Fructooligosaccharides, Fumaric Acid, Lactic Acid, Citric Acid, Malic Acid, Thyme Extract, Vitamin E Supplement, Zinc Sulfate, Ferrous Sulfate, Zinc Amino Acid Complex, Iron Amino Acid Complex, Inositol, Niacin Supplement, Copper Sulfate, Thiamine Mononitrate, D-Calcium Pantothenate, Vitamin A Acetate, Biotin, Manganese Sulfate, Copper Proteinate, Riboflavin Supplement, Pyridoxine Hydrochloride, Manganese Amino Acid Complex, Vitamin B12 Supplement, Vitamin D3 Supplement, Calcium Iodate, Sodium Selenite, Folic Acid, Rosemary Extract.